This week, I am having fun with Division! Here is another little activity that is a lovely way to introduce division. 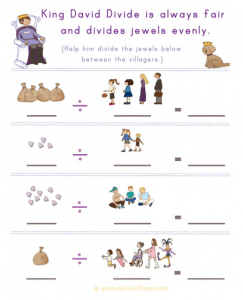 You all know I like my manipulatives, so definitely pull out your treasure chest, sacks, and jewels for this one! Sometimes I also like to also use little dolls from a wooden dollhouse or stuffed animals to act as villagers. If you don’t like to get that creative, then by all means, just look at the pictures on this page and help your emerging mathematician figure out the answers!